At the very heart of civilisation – indeed, of our evolution as humans – is our drive to learn new things. We grow by facing new challenges and adapting to changes, learning new skills and ideas from one another and passing them on. Education is often described as a privilege, but it is, in fact, a necessity. We are always looking for faster, more effective ways to communicate with one another and learn new things. These days, we live in an age where, increasingly, digital technology makes the impossible possible. 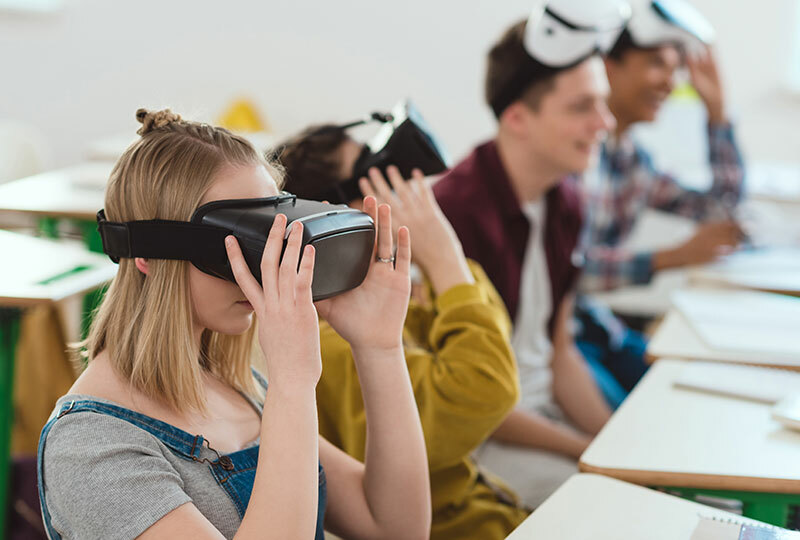 Virtual Reality (VR) is one of the most exciting of these technologies, but what exactly can VR do for education? The standard education curriculum puts emphasis on being able to remember and regurgitate information. The majority of school subjects will test students via a generic exam, which, arguably, is more a test of memory skills than of actual knowledge and understanding of the subject. This system is problematic for many reasons, not least because it operates under a ‘one-size-fits-all’ attitude. There is a big difference between education and information retention: knowing facts isn’t the same as learning, and while some may thrive within the current system, there are many who find it overwhelming. The result of this is less engagement, and more people who don’t have the skills or confidence to get what they need – and deserve – out of the education system. Naturally, all humans learn by being engaged with the world. Take the way we learn language, for example: we’re not, as toddlers, forced to sit down and start talking. We naturally learn by absorption, imitation and by becoming involved in a world where knowledge of language is essential for getting what we want. In the same way, VR worlds could open new doors to learning, and therein presents a potentially life-changing alternative to traditional education. By creating a whole, encompassing world – whether based on reality or fiction – VR can help stimulate the same pathways as our original language-learning brain, and create a much more effective means to absorbing new information. VR creates an interactive platform that students with all kinds of skill sets and backgrounds can engage with. The virtual reality world provides a fully immersive experience, connecting information with ideas in a way that is easy to process, and a more enjoyable way of learning. Using all-encompassing sounds and images allows users to make their own connections, and gives them a clearer, wider understanding of any given topic. It also makes it more memorable, because the learner feels like they have actually LIVED through an experience. VR also provides access to virtual imitations of real places, such as science labs, factories and businesses, which gives users hands-on, practical experience, without the expense or technicalities of having to arrange the real thing. Rather than just reading the facts in a book and learning the theory, students can learn through active engagement. VR can also help with creative development, providing tools that are fun and easy to use, and that won’t run out or require additional spending.